Meandering merrily away this week, I find myself in Listowel trying to meet brother Mickie and, as always, discovering that he, like myself, is rarely at home in the summer. Maura tells me he is down in John B. Keane's pub for one of the pub theater nights there, feeds me with a mighty fry and all the Kerry news, and releases me into the evening again. The aura and spirit of John B. still strongly inhabits Kerry's most famous pub. It hits between the eyes as you enter, and the entertainment is as varied and rich as Keane's own work. I spot Mickie and sit down quietly in the corner without contact because the treacle-voiced poet Gabriel Fitzmaurice is in full flight and, after him, the actor Paddy McAuliffe humorously brings light and life to some of John B's best lines from all the plays and stories. Eoin Hand, the former Irish soccer manager, is in the thick of it, and proves himself to be a splendid singer, and Billy Keane, the son of the playwright, is the emcee and linkman for a show whose peg, I learn, is that both John B and my own and Mickie's father Sandy are watching down on all of us from heaven --perhaps! I chuckle to myself in the corner because I'd just broadcast a piece on RTE radio two days earlier about all the stock we sold in Sandy's country shop back in the old days. A mighty night, the spirit of our beloved father very close, and it is our business what time we got home and went to bed. Family nights are the best of all. The last of Sandy's generation are funeral trips for us nowadays, long journeys up North to re-connect with younger graveside generations whom we have to be introduced to. Yesterday's children who are now grown men and women with their own children. I have to make maybe the last such trip for the old ones three days later and, returning, swing into lovely Leitrim on a whim to see the real genuine Garden of Eden! It has not vanished at all despite that assertion by Percy French in his song about Ballyjamesduff. And it is not in Cavan but in the lovely gentle hinterland of the village of Rossinver. I love its story. Maybe I mentioned it to ye before but, if not, it is the story of a young man from Manchester called Rod Alston who visited Rossinver 30 years ago together with a young woman with long red curling hair. They bought a tumbledown cottage with an old overgrown garden and an apple tree which had been felled by the last storm in front of the door. They propped up the old apple tree again, restored the cottage and developed that garden into one of the first and best organic gardens in the region. And, believe it or not, that cottage and garden are situated in the townland of Eden! And, believe it or not, the old apple tree recovered and has produced a million big green glossy Bramley cooking apples since. The project still flourishes as Eden Plants, and there is a good crop of apples this year too. I know that because Rod Alston himself told me so this very week. He was not there when I passed by, but we spoke on the telephone. He is easing back on the project nowadays, but this gentle gentleman is still living and happy in the Garden of Eden. You could not invent that story if you tried! I call on old friends in Boyle on an easy meandering way home. Coming out of town I pass the site of another story from an even earlier era which lingers in this head. I was a cub reporter for the local paper when I covered the sudden death of a circus clown of the small show visiting the area. 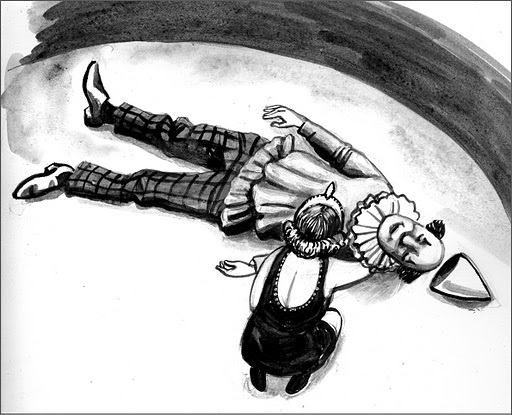 I'll never forget seeing him laid out in his clown's suit in his trailer that evening. Candles burned beside him. The evening show ran as normal. They buried him in the local cemetery and moved on to Ballymote. Suffered the loss of its senior clown. And one last item this week which, unusually, came to me across the Atlantic by email from a source I know and trust. This source says he believes that the most famous cottage in Ireland may now be for sale. It is the former home of the famed Clare witch Biddy Earley, whose legend will endure forever hereabouts. My source tells me it is likely to be on the market for a tag of about 75,000 euros because it is not in mint condition just now. There now would be an interesting buy.